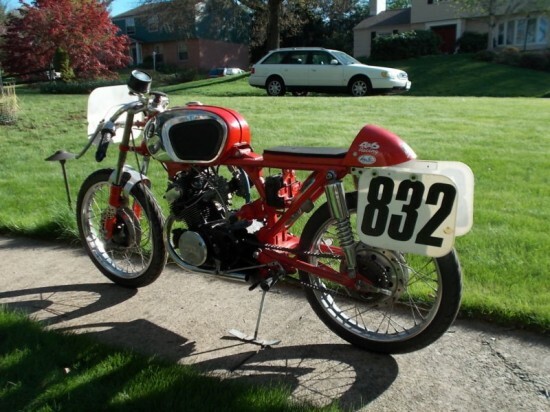 I read an article a while back in one of the major motorcycle publications about the wild and weird world of small-bore vintage racing. These brave souls hurled themselves around the racetrack on classic Honda 160cc twins, their little 80cc pistons furiously whirring out their meager power while the pilots clung flat to the tank, left arm tucked in of the bar for streamlining, right hand wrenching the twistgrip the stop and beyond, hoping desperately to wring a last bit of power from the wildly flailing motor. I’d mentioned this to a riding buddy recently, thinking it might be a cool way to actually go racing on a budget using machines that were less likely to kill us than the modern 600’s we’re currently using now to cut our track teeth. Okay, watching this video, maybe it’s not so tame… Note the Le Mans style start! And lo and behold, what did I find on eBay? A fully prepped race bike, all ready for the track. Just add new owner. 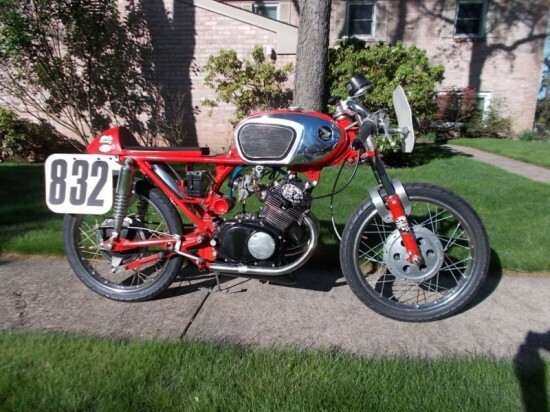 This road racer for sale is based on a 1966 Honda cb-160, but as you can see from the photos, much has been done. 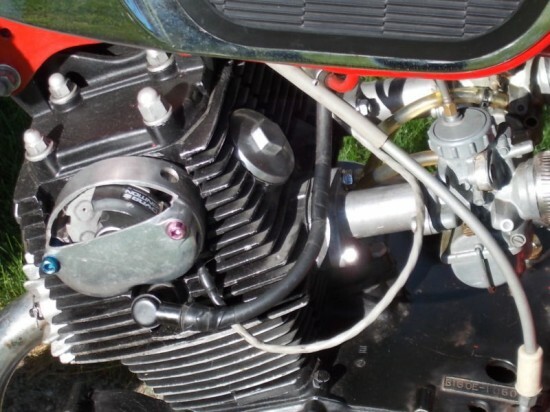 The main mechanical work has included a 5 speed gearbox (from a cb-175); Dyna-S electronic ignition; overbored with liners to 56 mm pistons. A megacycle cam operates 1mm larger valves in a flowed head. Everything related to street use has been deleted to reduce weight. New sticky tires, battery and oil catch pan have recently been installed as well as a fresh oil change and new chain. The bike has been fully safety wired and is ready to race. Although it is a tiny bike, the combination of the relocated seat and rear-set controls makes it suitable for anyone up to 6 feet tall. There is a useful and valuable set of spares that come with the bike, including cam and crank. Bidding’s just north of $1,000 right now and the reserve has not been met, with just a couple days to go on the auction. 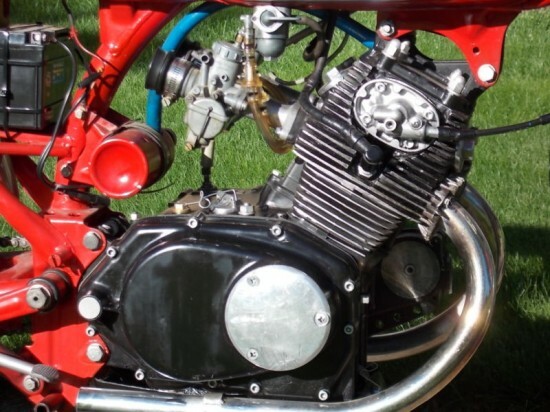 I love this trick little bike and it looks like the perfect way to get into vintage motorcycle racing if you’re on a budget or intimidated by the outright speed or complexity of the larger machines.